If you’re a real radio geek as I am, you probably did some scanning of shortwave radio, in addition to your AM and FM stations. In and around the static and sharp fading, the sounds of distant preachers and foreign languages would come in. And then you’d run across the unmistakable sound of the BBC. But every night here in North America, there was at least one of the only two rock stations I listened to on a regular basis. The first was on 15.420 Mhz – WRNO New Orleans – sometimes independent broadaster of rock, often simulcasting it’s 99.5 FM sister station, but always rocking. The other one was incredibly fascinating. Radio Luxembourg was 15.350 Mhz shortwave during the time I, your webmaster discovered it. But prior to 1989 I would have had to be in the vicinity of Europe to listen to it’s main frequency, 1439 Khz/208 meters. 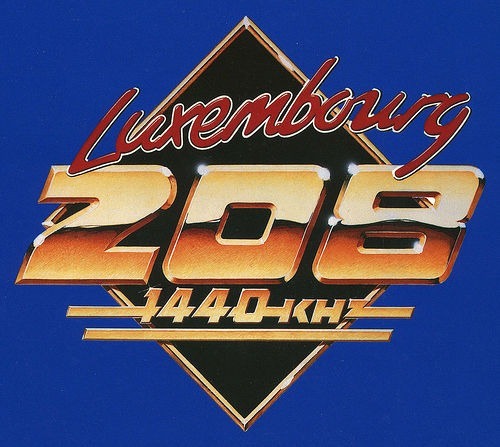 Thus, the slogan Luxembourg used, “The Great 208”. At 1,300 KW of output power (on the american equivalent of 1440 AM), it’s considered the most powerful commercial station ever! This post is written from an American perspective, and so, perhaps its difficult to realize the enormous impact which Radio Luxembourg had in Great Britain. There are pages and pages – in fact a whole website or two dedicated to the history of Luxembourg, in addition to assorted airchecks of the station which reside in various places throughout the web. Perhaps the American station with the closest history, between controversy and high power, would be Powell Croseley’s WLW Cincinnati. But even WLW never got close to a station putting out ONE MILLION, 3 HUNDRED THOUSAND WATTS!! Radio Luxembourg did. And its influence was far and wide. In December, 1983, RTL (as it was known for a while) produced a special for it’s 50th anniversary of broadcasting. It was hosted by longtime jock Noel Edmonds. Listen now as we bring you back 30 years, to celebrate the previous 50 years on Radio Luxembourg – a remarkable station which no longer exists as an over the air entity. I discovered Radio Luxembourg when I was stationed in Germany. The Signal was Horrible but the station itself was great to listen to. Radio Luxembourg was the closest I could get to Top 40 radio in The states. it was a high energy station with Great Air personalities.